October | 2018 | Nicholas Hoffman & Co.
During these times of market weakness and volatility, it can be tempting to make major changes to one’s portfolio to ‘time’ the market. While tactical shifts like these can sound like a good idea, evidence over time suggests they often cause more harm than good. Instead, it is generally better to use these times to look for opportunities to re-evaluate your risk appetite and to rebalance, or nudge, your portfolio in a direction that is consistent with long term goals. There are many pitfalls with market timing. The first, and easiest to forget, is that it must be timed correctly on both sides of the trade. Selling into a down market requires an eventual re-purchase. We do not want to catch a falling knife of course, but we also need to buy back into the long-term targets at some point down the road. Both can be difficult decisions to get right. Research by Dalbar, a market research firm, suggests that the single biggest loss to retail investors came in October 2008. At one point in that month the S&P 500 was down 27%. Had an investor sold equities into this market they would have missed out on the subsequent increase that brought the index back up to a 14% loss for the month. The second issue that should be taken into account is trading costs. While the ticket cost of many trades is now reasonably low, position spreads can significantly widen during times of volatility. While nominal on an individual trade basis, these can add up to significant amounts in a heavily traded portfolio. Finally, there is the opportunity cost of getting in and out of markets frequently. Over the long-term history of the S&P 500, missing one or two months of positive performance can decrease your total return by several hundred basis points. A less radical approach to attempts at market timing is taking advantage of opportunities for strategic rebalancing. Decisions on rebalancing a portfolio can be tough however, as it often means that you will be trimming areas and positions that have been up, or provided a safe-haven, and adding to the recent losers in the portfolio instead. At first sight this does not seem to make sense. Why would I sell the investments that have brought me much value? Research suggests however that appropriate rebalancing is the most effective way to ensure that an investment thesis bears out in the long-term. What was a winner today may well be very disappointing tomorrow. Tax consequences must be considered before rebalancing, but stressful markets can make it easier to come up with losses to counteract gains and get you to your goals in a tax neutral setting. In times like these it is good to want to re-evaluate our portfolios. But it is also good to maintain diversification and a strategic asset allocation. We are here to help be a sounding board and to make sure that your portfolio reflects your individual financial objectives and investment thesis. 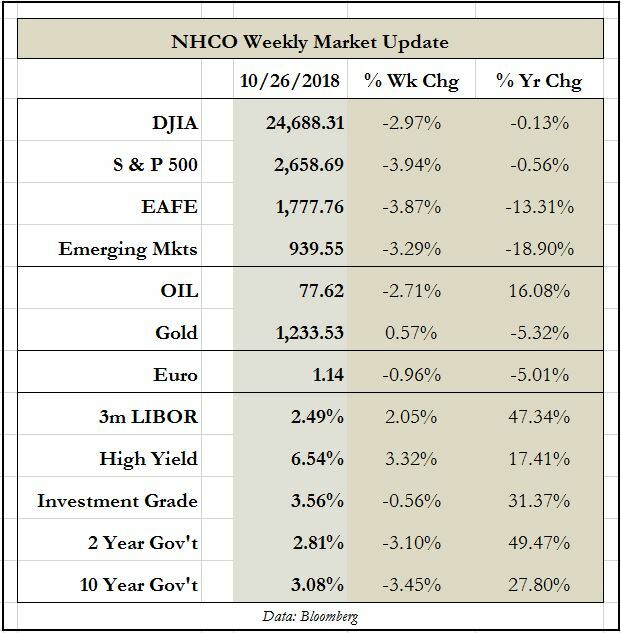 This entry was posted in The Weekly on October 29, 2018 by nhoffmanandco.